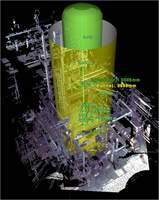 Collision check before the new reactor of the OMV refinery Burghausen is lifted. As a highly productive engineering contractor we are operating a state-of-the-art IT network using advanced software. In addition to well-known systems, such as the CAD programs Comos PT and SmartPlant P&ID for flow diagrams linked to databases, or 3D planning tools, such as PDS and SmartPlant 3D, we are also working on proprietary systems. When it comes to stocktaking in revamps, for example, laser scanning is the superior method in terms of time and cost. Among the diversity of tools every customer can find his preferred software.